At bottom left corner, collection mark of Defer-Dumesnil (L.739). At top left, inscribed "champ de bataille d'Elau" in graphite by Gros. On February 8, 1807, Napoleon fought a bloody, indecisive battle against combined Russian and Prussian forces near Eylau, a town in East Prussia on the Polish border. Five weeks later, the director of the Musée Napoleon announced a competition for the commission to paint the Emperor on the battlefield the day after the actual fighting. 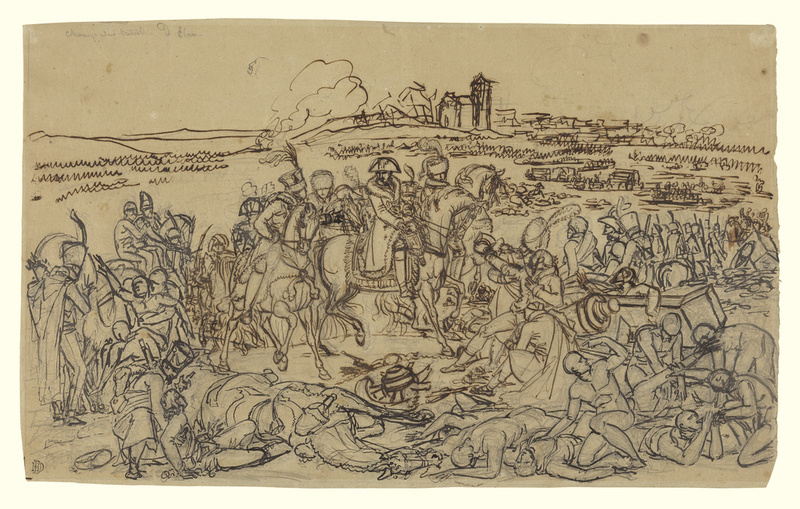 The director ordered the artists to show the Emperor surveying the battlefield and directing his troops to assist the wounded. A specific story was to be included, involving a wounded Lithuanian soldier who offered his allegiance to the Emperor if he would heal him. Scholars believe this drawing was made by Antoine-Jean Gros as a preliminary study for an oil sketch that eventually won him the commission for the final painting, now in the Musée du Louvre. The artist quickly and loosely sketched his early ideas in pencil first and then drew over the outlines in thick black ink. He placed the Emperor Napoleon in the center of the scene, riding among the wounded and dying. The wounded Lithuanian soldier reaches up to attract Napoleon's attention as he approaches. This compositional sketch concentrates on the figures' positions and gestures rather than details of costume and facial expressions. Pierre Defer, French, 1798 - 1879, by inheritance to his son-in-law Henri Dumesnil, 1870. Art Market (Lausanne, Switzerland), sold to the J. Paul Getty Museum, 1983.